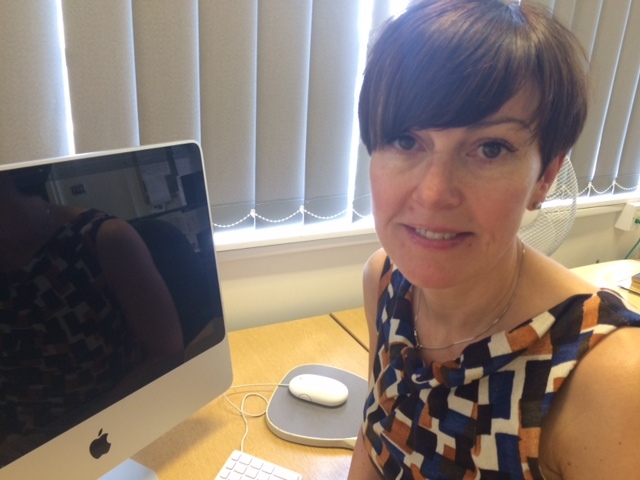 Sue Jenkins is Acting Senior Lecturer in the Department of Anaesthetics, Intensive Care and Pain Medicine. The ‘Acting’ part of her title means that she is building her University and National professional profile to become a Senior Lecturer. On a day to day basis this role includes managing a postgraduate team of academics that deliver interprofessional, e-learning, postgraduate MSc level courses and modules and she is course leader for the primary and community care based pain management courses and modules. Sue joined the department in 1996. Her original role was as a Research Nurse, co-ordinating clinical trials and during this time she started assisting Dr Ann Taylor, on the first MSc Pain Management in the world. Sue has been in the department for almost 20 years. So what’s the secret to her working attitude? In 2008, Sue validated the MSc in Pain Management programme to become purely e-learning. This enabled the introduction of new and novel methods to deliver course content as well as introducing new assessment methods. After employing Karl Luke, our e-learning technologist to facilitate this process, the new platform was developed and now includes tools such as blogs and wikis for student assessments. Sue co-ordinated and was part of the team who set up http://paincommunitycentre.org – a free pain management website for healthcare professionals. This builds on her long standing experience with and innovation in the digital realm. But it’s not just e-learning that Sue is interested in. More recently, she has collaborated on a piece of qualitative research with Fran Toye, Senior Qualitative Researcher, Nuffield Orthopaedic Centre, Oxford. The project was based around an evidence based film that Fran Toye et al (2013) developed, based on the findings of a meta-ethnography of patients’ experiences, on living with chronic pain. This year, Sue has become a member of the British Pain Society Education Special Interest Group (SIG) committee, and a member of the Primary Care SIG. She has also had an article published in the British Journal of Pain and is currently examining other areas of the postgraduate education that is delivered here in the department, to submit further articles for publication. She is also part of a team going to South Africa in August, to run a ‘Train the trainer’ on education in pain management, for Mundipharma.